Les internautes du site web du journal ont également élu Assange comme « homme de l’année » (56,2%) devant le Prix Nobel de la paix le Chinois Liu Xiaobo (22,3%) et l’Américain Mark Zuckerberg (6,9%), le fondateur de Facebook. La semaine passée, Time avait sacré « homme de l’année » Mark Zuckerberg, un choix contraire à celui des lecteurs du magazine américain qui se portait sur Julian Assange. © 2010 AFP. Cette entrée a été publiée dans 999, Chaos Materia Prima, La Revue de Presse, et marquée avec 9/11, 999, abode of chaos, afghanistan war, anonymous, Assange, Bank ofAmerica, Cyberpunk, demeure du chaos, Ehrmann, espionage act, hacker, Internet activists, Iraq war, Julian Assange, julien assange, Le Monde, New York Times, OpenLeaks, owni, StateLogs, The Guardian, Thierry Ehrman, warlogs, Wikileaks, wikileaks-founder, le décembre 23, 2010 par materiaprima. Julian Assange has been arrested and refused bail but the Wikileaks organisation remains operational despite US cyberattacks. Whistleblower website Wikileaks founder Julian Assange, who has been in virtual hiding in south-east London, has been arrested on a European arrest warrant by British police over alleged Swedish sexual assault claims. Assange, who appeared at a police station at 09.30 today by appointment, has been refused bail and will be remanded in custody until December 14 when a extradition hearing will take place. Wikileaks has vowed to continue with the publication of US diplomatic cables despite the arrest of its founder. The arrest follows repeated cyber attacks on Wikileaks and the freezing of Assange’s bank account by Swiss post bank PostFinance. The arrest is being interpreted by his supporters as a US-led campaign to decapitate the Wikileaks project in the wake of Cablegate. Opponents of Assange are pleased to see the legal net tighten on a man they consider a dangerous, unaccountable renegade who endangers lives in the quest for transparency. According to The Guardian, one of the news organisations carrying the Wikileaked cables, Assange has told friends he is increasingly convinced the US is behind Swedish prosecutors’ attempts to extradite him for questioning on the assault allegations and believes that Sweden is behaving as “a cipher” for the US. 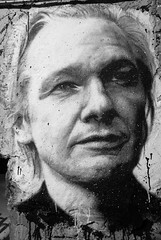 “As the legal net continued to close around the whistleblowers’ website and the US attorney general, Eric Holder, said he had authorised ‘a number of things to be done’ to combat the organisation, Assange appeared to be reconciling himself to a lengthy personal court battle to avoid extradition to Sweden,” interpreted Owen Boycott at The Guardian. US at war with Wikileaks? 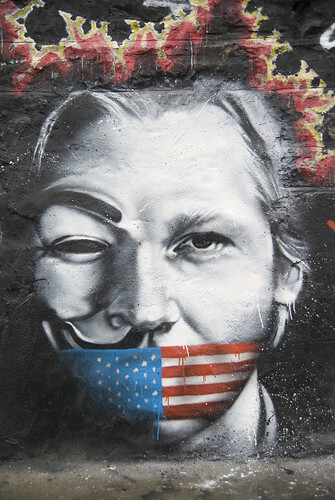 US political condemnation of Assange has become increasingly vicious. Sarah Palin described Assange as “an anti-American operative with blood on his hands” and senior Republican Mike Huckabee said that “anything less than execution is too kind a penalty.” Indeed, anti-Wikileaks hysteria has spread like wildfire through Washington. “The federal government seems to have lost its mind in a manic game of internet whack-a-mole aimed at getting the Wikileaks State Deaprtment cables thrown down the memory hole,” reported Gawker in relation to news that US military in Iraq are being warned they are breaking the law if they read the leaks online. “The feds have clearly lost it. Many of those soldiers receiving the warnings have security clearances that would have granted them access to the State Department cables before they were leaked,” pointed out Gawker. Internet versus old world order? Cette entrée a été publiée dans Chaos Materia Prima, La Revue de Presse, et marquée avec arrested, extradition, julien assange, London, secrecy, Sweden, The periscope post, UK, under arrest, Wikileaks, le décembre 8, 2010 par materiaprima. According to Laurent COURAU, the mythical founder of the Spirale who is postponing his suicide, “Assange and Wikileaks have definitively relegated fiction to beneath reality and we are seeing a veritable incarnation of the cyber-punk imagination right now in this early 21st century”. Selon Laurent COURAU, fondateur mythique de la Spirale qui repousse son suicide, il déclare : « Assange et Wikileaks relèguent définitivement la fiction loin derrière la réalité et l’on assiste à la véritable incarnation de l’imaginaire cyber-punk dans ce début de XXIème siècle ». Ultime précaution : Julian Assange a placé sur le serveur suédois de Pirate Bay (spécialisé dans les téléchargements illicites de musique et de films), un petit fichier crypté mystérieux, baptisé »Assurance historique ». Sur Twitter, il recommande à ses partisans de le télécharger et d’attendre les instructions. Cette entrée a été publiée dans Chaos Materia Prima, Demeure du Chaos 10 ans, Thierry Ehrmann : aVentures chaOtiQues, et marquée avec abode of chaos, Cyberpunk, Cygne Noir, demeure du chaos, Der Spiegel, El Pais, Julian Assange, Le Monde, Lorenz, New York Times, Nodis, Pirate Bay, Réalité, Science-fiction, State of the Future, StateLogs, The Guardian, thierry ehrmann, Wikileaks, le décembre 3, 2010 par materiaprima.